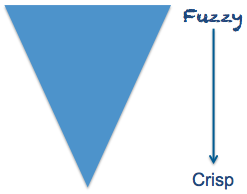 Like most everything in life, the making of an outsourcing transaction is a process of taking amorphous ideas and concepts (fuzziness) to a point where there is sufficient clarity for all involved to move forward in a coordinated and desired manner (crispness). While true for all transactional components of an outsourcing, it couldn’t be more so for what’s at its heart – the services. There are plenty of analogies that could be used, but the consultant in me feels more comfortable with an inverted triangle. Just recognize that time progresses as one moves from top to bottom and the mechanism is nearly complete. The question becomes, where do you start and where does it end? For most, the journey begins with the customer’s objectives. They could be big, bold architectural/strategic statements of value or they could be more granular in nature, but to make sure a sourcing ultimately delivers what is expected, it’s a good idea to make sure there are some guideposts (like written objectives) to keep it all in perspective. With the objectives known, the scope of the services to be sourced can be developed. In this way, there will be direct linkage between the objectives to be achieved and the services to be provided. Doing otherwise is like playing with fire. At this stage, the objectives and scope that define “what” comprises the sourcing are typically packaged into some kind of sourcing vehicle (such as an RFP) and sent to a single supplier (when sole-sourced) or multiple supplier candidates (when competitively sourced) for them to develop a solution. While there are various philosophies on how much freedom a supplier should have to develop a solution, the solution should describe “how” the services are to be delivered. As the sourcing process continues, the customer works with the suppliers to refine the solutions, as well as understand the activities that would occur during the transition to develop further how the services will be taken over and operated over time. To supplement the contract, the customer would also work with the suppliers to understand what information and additional level of detail will be needed to address the day-to-day operation of the services. This dimension of the sourcing relationship typically is addressed (or should be) in a policy and procedure manual (the PPM) that will guide the interface between the customer and its supplier. 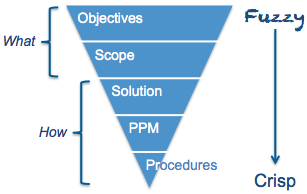 The PPM, which is oftentimes overlooked, should be developed by the supplier for the customer’s review. This manual is an additional step for moving from fuzzy to crisp as it serves to describe the operational aspects of “how” interactions between the parties will occur at the lowest level of detail. It should undergo the same (or a higher level of) scrutiny as the solution received during the sourcing process. While the PPM defines the customer-supplier interface, the supplier must also have procedures that describe how it will carry out that part of its responsibilities that are fully within its swim-lane. While some suppliers consider these desk-level procedures to be their “secret sauce”, any auditor will tell you that they must exist and be up-to-date, as the vast majority of the services to be provided will be performed based on such procedures. The end result is an approach that can take abstract/disjointed ideas, thoughts and concepts about desired results and generate, through a series of sourcing processes, successively more refined statements of operations that in combination serve to define the services contractually and the work procedurally.